KARACHI: Foreign investment in Pakistan’s economy slowed down significantly as inflows dropped 45% to $128.1 million in July, a wake-up call for the authorities concerned to revise investment policy and make it more attractive. Foreign direct investment (FDI) stood at $233.8 million in the same month last year, the State Bank of Pakistan (SBP) reported on Friday. This is not for the first time foreign investment inflow has remained sluggish. The trend has persisted for the past several months, especially since political noise erupted in the country with the disqualification of former prime minister Nawaz Sharif in July last year and political parties geared up for general elections this year. Pakistan Business Council (PBC) Chief Executive Officer Ehsan Malik suggested that recent political uncertainty may be one of the reasons behind the drop in foreign investment as investors could be observing the situation closely. Irrespective of that, “we have been demanding that the Board of Investment (BoI) revise the FDI policy to invite investment in export industries,” he said. Formal export sectors of the economy have hardly attracted any FDI over a long period of time. Consumer goods sectors like food and fast-moving consumer goods have attracted most of the FDI, but some of the investment has proved short-lived due to the short-term nature of business cycle. He was of the view that FDI in export-focused sectors like textile would help the country narrow down a huge trade deficit, a recurring problem for the economy that has given birth to balance of payments woes. The slowdown in FDI may be linked to delay in financial close of several projects under the China-Pakistan Economic Corridor (CPEC), he added. Malik was hopeful about the revival of FDI flows in coming months following a smooth political transition to a new elected government of Pakistan Tehreek-e-Insaf. Overseas Investors Chamber of Commerce and Industry (OICCI) Secretary General M Abdul Aleem said the other day the recent drop in FDI came after foreigners put projects for Pakistan on hold during the political transition. He anticipated an increase in the pace of foreign investment from September or October this year as the new government was going to announce its economic team in the current month. China remained a blessing in disguise on the FDI front as it continued to pour capital into Pakistan under the multibillion-dollar CPEC programme. 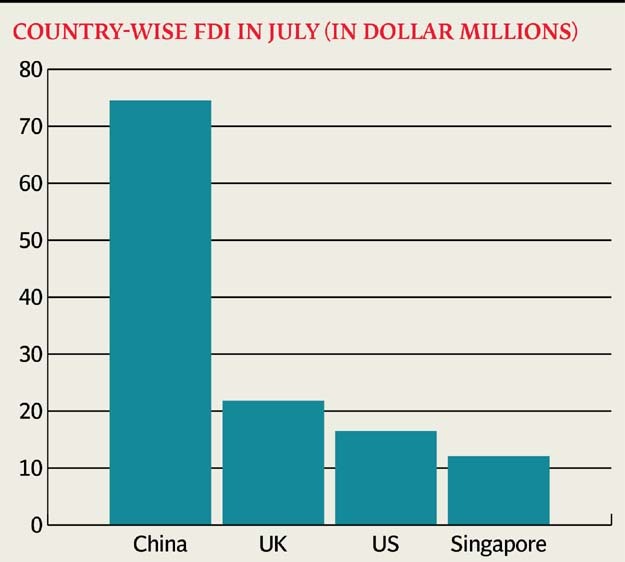 Without Chinese investment, the FDI would have been more than 50% lower in July and previous months as well. China invested a net $74.5 million, accounting for 58% of the total FDI of $128.1 million in July 2018. The United Kingdom was the second largest investor with net FDI of $21.8 million, while the United States came third with net investment of $16.5 million. Singapore invested $12.1 million in the month. Kuwait divested a net $20.6 million while the Netherlands pulled out $10 million in the month. The construction sector recorded the largest inflow of $54.6 million in FDI, followed by oil and gas exploration sector which received $12.9 million. Trade and transport sectors attracted $10.9 million and $10.2 million, respectively, in the month. Foreign investors sold shares excessively at the Pakistan Stock Exchange (PSX) in July and offloaded stocks worth $42.1 million compared with $11.4 million in July 2017. Such investors from Luxembourg and the United States sold shares in net of $20.1 million and $14.6 million, respectively. The increase in divestment may be attributed to heightening political uncertainty ahead of general elections and a sharp depreciation of the rupee against the US dollar in June and July.